Our goal is to keep fiber grading as straight forward as possible on the farmer's end. 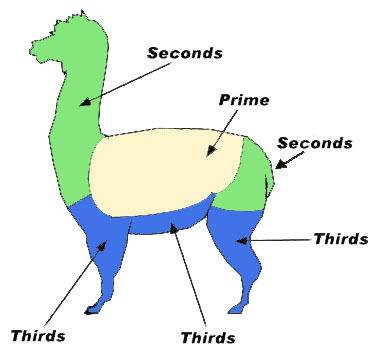 Our system is designed to be simple to understand while identifying the areas of the alpaca with different levels of fineness and staple length. We ask that all farm's submitting fiber keep it separated into the three basic grades, based on how it comes off during shearing. Fiber should be sheared, kept separate by shearing location, and quickly skirted to remove barn yard debris and short cuts under 1.5” in staple length. From there our sorters will work through it and provide total poundage of each grade submitted along with any notes they feel will help farms prepare future fiber submissions. NEAFP does not require fiber to be sorted before it is submitted to us. Prime or Blanket: Comes from the area of an alpaca where a horse blanket would fit. Typically the finest, most uniform fleece from an alpaca. 3-7” in staple length with a minimum of coarser guard hair throughout fleece. Secondary: Similar to Prime, with shorter staple length and slightly coarser handle. 1.5 to 5” staple length, slightly higher percentage of guard hair than Prime or Blanket. Third-Grade: Coarsest of all alpaca fiber including the highest percentage of guard hair. 1.5 inch and up staple length. Our sorters will take your submitted fiber and sort through it. Keep in mind that depending on a particular animal's genetics and age, their fiber may be too coarse or contain too high a percentage of coarser guard hair to be sorted in as the grade it was submitted as. Some fiber will be up or downgraded by our sorters based on it's overall quality and uniformity. We will email you a fiber deposit confirmation with the total poundage of each grade checked into your account along with any notes from our sorters so you can get a better understanding of the fiber submitted and how it was graded. Fiber Harvesting Guide [PDF]- Get the most usable fiber out of each year's shearing. Fiber Collection Guide [PDF]- Learn how to successfully submit your fiber at a NEAFP Fiber Collection. Fiber Collection Section - Explains the various ways you can submit your fiber to NEAFP.